The French scientist Olivier Voinnet, responsible for probably the biggest fraud scandal in plant sciences, is back in the news. His present employer, the Swiss university ETH Zürich has now concluded, in collaboration with Voinnet’s past employer French CNRS, their second investigation into data manipulations in Voinnet papers. ETH’s previous investigation from 2015 found Voinnet guilty of research misconduct after he admitted to have manipulated his data, during his entire academic career and all by himself, without the knowledge of his supervisors, peers or lab members. The photoshopper Voinnet was portrayed as a distrait genius suffering of a form of self-harm syndrome, who needlessly attacked his own perfectly valid and reliable research data. With the new ETH announcement comes a surprising twist of this real-life academic sitcom, where research integrity became a sidekick to laugh at: Voinnet is innocent of any data manipulations. Someone else did it, behind his back. To me, ETH announced that the Voinnet case is closed forever, no new evidence of data manipulations is admissible, and no new investigation will ever take place, no matter what else might be found. This is important, because new evidence of Voinnet’s so far overlooked data manipulations keeps emerging. In 2014-2015, around 40 Voinnet papers were flagged for suspected data manipulation on PubPeer (by now, there are more, almost the entire body of Voinnet’s research output is tainted). Both ETH and CNRS announced investigations, while they declared those figures to be mere “illustrations”. The new press release avoids this description, at least some progress. Unlike the previous ETH report, this new one by ETH-CNRS from 2018 is secret, as is the 2015 previous French one. Also secret is the list of the 5 papers from Voinnet’s CNRS lab in Strasbourg which were investigated and found to contain fraud. Voinnet (right), with his Strasbourg colleagues and a cake. Photo: CNRS. Following is the press release by ETH Zürich from 6 September 2018, interspersed with my comments. Its title is apparently intended as ETH’s final two-finger salute to all decent scientists out there, who still think science is about actual research, and not publishing irreproducible and fake stuff in elite journals in order to get your hands on public jobs, power and funding money. “An independent commission of inquiry led by the French National Center for Scientific Research (CNRS) with the participation of ETH Zurich has investigated the publications of ETH Professor Olivier Voinnet’s former research group at the CNRS. The inquiry uncovered manipulation of certain figures. However, the commission’s report confirms that Voinnet did not personally initiate this manipulation. The inquiry uncovered manipulation of certain figures. However, the commission’s report confirms that Voinnet did not personally initiate this manipulation. Nevertheless, since he held overall responsibility as group leader, the university has reiterated the formal warning given to the professor and extended it for another five years. The investigation discovered not only negligence and errors connected with figures in the five publications reviewed, but also evidence of intentional manipulation. These shortcomings, described as “severe” by the Executive Board of ETH Zurich, go beyond those described in the original 2015 report by the ETH independent commission of inquiry”. In contrast to this new whitewashing enterprise, the 2015 Voinnet investigation by ETH was more transparent: the full report was published by ETH, 6 retractions were requested and 8 happened (one paper requested for retraction was saved by Science editors). One of the two external investigators, Witold Filipowicz, had an undisclosed conflict of interest: his relationship to Voinnet’s PhD advisor and senior author on several papers under investigation, David Baulcombe, was inappropriately close at that time. Incidentally, Filipowicz and his co-investigators did not recommend any of Voinnet’s papers from Baulcombe lab in Norwich, UK, for retraction (though retractions happened anyway). Instead, the report fingered a peer as suspected culprit of “an organised effort to discredit OV and inflate accusations against him”. That peer was the Voinnet debunker microbiologist Benjamin tenOever, and he had absolutely zero, nothing, rien, gar nichts to do with the avalanche of PubPeer posts of 2014-2015. You can either take my word here, or ETH’s. So now, 3 years later, we suddenly learn that Voinnet in fact never manipulated anything. Someone else did it. Maybe it was Leonid Schneider, ETH in fact once threatened to have me prosecuted for espionage under “Art. 320 STGB”. The current Swiss press release explains that where previously only was unintentional misconduct (fake images inadvertently slipping into published papers), they now found outright fraud. But luckily “not by Olivier Voinnet himself”. “The CNRS independent commission of inquiry worked under the leadership of an independent representative of the Institut Pasteur and also included two ETH representatives. ETH Zurich is now drawing its own conclusions, independently of the CNRS, based on the report’s findings. The 2015 investigation ordered Voinnet to cede control of his Strasbourg lab and focus on working in Zürich only. From there on, the lab at the CNRS Institut de Biologie Moléculaire des Plantes (IBMP) in Strasbourg was run by Voinnet’s right hand man, Patrice Dunoyer. Until earlier this year, that is. It was dissolved in utter secrecy in January 2018, and Dunoyer departed to his far-away home island of New Caledonia. Come to think of it, the claim “figures were manipulated, but not by Olivier Voinnet himself” might even be partially true. IBMP is a place where data manipulation is standard well-established practice (now officially endorsed by CNRS after the Catherine Jessus scandal), and the problem of insufficient research integrity starts with the institute’s director herself, Laurence Drouard. In this regard, the announced blaming of any IBMP scientists is unlikely to hit an innocent here. This is actually very insightful. Because Voinnet was still under a formal warning from 2015, if he were to be found guilty of any research misconduct ever again, ETH would have no choice but to sack him. Especially now that actual fraud was suddenly found. Sacking Voinnet is obviously an unthinkable solution, to be avoided at all times and at all costs. Even if to prevent Voinnet from finally opening his mouth and telling on every single one of his peers worldwide who also engaged in research fraud and other dishonest academic activities. “The ETH Zürich has exhaustively investigated the responsibility of Professor Voinnet in two independent investigations and took appropriate measures. Therefore, we will not follow up on your notification”. It is not the first time ETH tells own Ombudspeople who can be investigated and who is above the law. In an earlier mobbing case around ETH astronomy professor Marcella Carollo, the university pushed the ombudsman aside and only acted when the bullied students finally managed to get their story into the press. The astronomy institute was dissolved, but Carollo only sent on sabbatical. It is of course not true that ETH or CNRS investigated any of the new evidence published on my site or on PubPeer, simply because they didn’t have it at that time. In 2015, they selected 32 flagged Voinnet papers for scrutiny, found only 20 worth criticising and only specifically addressed some of the evidence for each of them. No forensic analysis to find more was invited, and Voinnet only admitted to what was already known. This second investigation only happened exactly because the first one did not cover all problematic Voinnet papers, while additional data rigging in those already investigated ones was discovered after the 2015 report was published. The main message from the ETH email is: no more evidence against Voinnet will be admitted. There will never be another Voinnet investigation, ever. Which in return means, Voinnet is in principal free to fake data again, as long as it helps ETH to papers and funding. Nothing will be admitted anymore, because Voinnet is innocent in the past. present and the future. Including this new evidence I received from a reader, on a rather recent Voinnet-coauthored paper Uddin et al Nucleic Acids Research 2014. ETH is sure not interested. Nobody, neither Voinnet nor any of his coauthors who either manipulated data themselves or accepted their boss’ manipulated figures in their papers will be ever investigated. Basically all Voinnet’s first authors are professors, tenured group leaders or on tenure-track. The second generation trained in Voinnet’s art of sciencing is already entrenched in academia, and they are now training the next generation. The ETH maintains that Voinnet’s scientific legacy is still fully reliable, the manipulations were meaningless in this regard. But what actually makes them and CNRS assume Voinnet’s science was pristine and correct, and his manipulations a kind of self-harming vandalism of a perfectionist genius? Of course nobody ever released any of that original data which Voinnet used to prove his innocence. And as to what Voinnet submitted as corrections: those were in fact different, newly generated figures, in a number of cases those corrections themselves were rigged in Photoshop. The legend of Voinnet’s scientific achievements being objectively unblemished by data manipulations is something his loyal investigators and enablers at ETH, CNRS and elsewhere can tattoo on their foreheads, but it still won’t make it true. As mentioned above, some of Voinnet’s scientific claims were debunked by tenOever, and ETH took revenge on him for that. My earlier reporting (here and here) covered my prolonged attempts to find any support in academic community for Voinnet’s main research findings on miRNAs being the main antiviral long-distance gene silencing agent in plants. Aside of David Baulcombe’s own work, there was absolutely nothing. In general, not a single paper in Voinnet’s entire body of work was so far named to be objectively reproducible. Voinnet basically directed ETH and CNRS in their investigations, and then dumped the blame with his French colleagues at IBMP. Which I personally can understand: CNRS was mean to Voinnet, excluding him from ever returning to work in his native France and taking away his IBMP lab. And now same CNRS defends Voinnet’s former superior Jessus for doing same kind of gel band copy-pasting he did. Not fair at all, and now is payback time. The French won’t be happy about that, but Voinnet’s own standing with the germanophilic Swiss ETH is safe now, at least as long as he continues publishing is elite journals as he does now. That was the ETH press release. Swiss newspapers simply re-chewed it, unquestioningly. But there is still the French daily Le Monde, which has been covering Voinnet affair since its very beginning, and also reported about other French research misconduct scandals I set in motion: those of former CNRS president Anne Peyroche, and the CNRS chief biologist Catherine Jessus. For the latter, Le Monde journalist David Larousserie became subject of a grotesque witch hunt by French academic elites, where 500 signatories publicly called for his head. Le Monde found out that CNRS might announce their own findings later this September. So we can take bets now who the culprit will be. I tip on Dunoyer, who left science and France anyway. The Voinnet affair demonstrates that science is utterly unable to self-correct itself. The problem: there is barely anything black and white here. Those Voinnet peers and coauthors who quickly took distance from him in public, while working behind the scenes to keep him in his professorship, are not that innocent themselves in their own research activities. For example, the University of East Anglia refused four times in the course of 2 years to disclose to me the results of their investigation into Voinnet’s PhD thesis under Baulcombe. The dissertation contains same fake figures Voinnet admitted to have manipulated, the relevant papers were corrected or retracted. To me, the university even refused to admit if there was an investigation. All my four Freedom of Information inquiries were rejected outright, to protect Voinnet’s privacy. Dale Sanders, director of John Innes Centre in Norwich, which back then used to grab official credit for those same manipulated Voinnet’s papers, managed to both defend Voinnet and distance his institute from any association with him, and concluded with calling me an “internet troll” whose writings are not “peer reviewed”. Update 24.10.2018. Please see today’s statement by Nick Talbot in the comment section on the investigation procedure. Plant sciences are becoming a total mess, almost on a par with cancer or stem cell research, in a sense that the academics are unable to deal even with the worst cases of research fraud. There are some clues as to why. The scientific board evaluation at IBMP in 2017 was a clown circus show, where both the examiners and examinees had manipulated data in their papers. And on PubPeer there is even evidence of rather questionable data in papers authored by some very vocal Voinnet critics from Germany, here, here and here. Elites failed once again, and never have heroes. Yet even Voinnet remains one, for many in plant sciences. It is the journalists who uncover the fraud who are seen as the enemies of scientific thought and stalking perverts. Update 3.10.2018. What if CNRS adjust their decisions to my reporting? As I predicted above, Dunoyer was indeed alone blamed for everything. CNRS now even admitted to have sent him back home to New Caledonia. Rumours go the decision was made by Catherine Jessus together with IBMP director Laurence Drouard. If true, if would be like two cats blaming the dog for having eaten the canary. In recent months the CNRS has conducted two new disciplinary procedures for scientific misconduct involving two CNRS senior researchers. Patrice Dunoyer was penalized with a demotion in rank, and Olivier Voinnet with an official reprimand. “These two new disciplinary procedures for scientific misconduct involve Olivier Voinnet, a CNRS senior researchers who is currently on temporary assignment at ETH Zurich (Switzerland), and Patrice Dunoyer, a CNRS senior researcher who is currently on temporary assignment at the Secretariat General of South Province, New Caledonia. These procedures follow upon the establishment of a scientific investigative committee that conducted an in-depth examination of the scientific practices and approaches of the two researchers. These two scientists had already been the subjects of a disciplinary procedure in 20151. As a result of the lapses identified at the time, the authors published corrections for the articles that had been called into question. The two procedures from 2018 concern some of these corrections, as well as new publications. The investigation established that a number of incomplete corrections had been sent to scientific journals, which included previously manipulated images that had not been corrected, along with at least one new manipulation of an image. These lapses, which fall under scientific misconduct, damaged the image of the CNRS, and more broadly that of the overall scientific community. Following an in-depth examination of the scientific practices and approaches of the two researchers, the disciplinary hearing judged that Patrice Dunoyer’s responsibility in this new scientific misconduct had been proven. With regard to Olivier Voinnet, his active participation in fabricating the corrections that were called into question was not established; nevertheless, CNRS management deemed that he could not be cut off from his responsibility as group leader. By decision of the CNRS President, Patrice Dunoyer was penalized by a demotion in rank, and Olivier Voinnet with an official reprimand.”. “Following the file examination, the interview of the expert cited by the legislature, the hearing of Mr. Voinnet, and the hearing of the witnesses cited by Mr. Voinnet, the Disciplinary Council holds as established that Mr. Voinnet has alerted other authors to the problems raised in contested articles and corrigenda as soon as he knew about it. The Disciplinary Board could not establish the materiality of Mr. Voinnet’s personal responsibility in these serious failings. An issue of the deliberation, the members of the commission not being able to establish the materiality of the personal responsibility of Mr. Voinnet, do not find any serious fault committed by Mr. Voinnet. The Joint Administrative Commission gives the opinion not to impose a sanction. This vote received 7 votes in favour and 1 abstention. 0 votes against. It may not be so easy for CNRS to blame Dunoyer because as the photo of him you used shows, he received the bronze medal of CNRS in 2010, which, is the most significant French award for junior CNRS members. CNRS will have to admit they gave the award to someone with personal views on ethics. Voinnet already embarrassed the French Académie des Sciences, they had to shut down IBMP, had to deal with Peyroche’s and Jessus’ scandals. Given the connection between Dunoyer and these people, why put salt on fresh wounds? Better sweep things under the carpet and avoid further embarrassment for the French plant science community. I guess it would be such a relief if a French got a Nobel next month, so these unpleasant reports are quickly forgotten. Dream on =) A nobel will not make this go away. @Ana Pedro: not sure I understand the sentence? We’re not quite there. Yet. Correct. IBMP is still in business. My bad. I am embarrassing myself now. I wrongly wrote IBMP had to be shut down. It is still active. My bad. I found the ETH press release highly positive. If my understanding is correct, this top-level institution endorses the abrogation of heads-lab responsibility and promotes cheating. If something should go wrong, a Commission will be established to issue a “formal warning”. This is perfect for me! I’m obviously working on a smaller scale compared to any-material-CNRS-medal laureate. However, I assume that the notice published by the Commission is valid at any scale. I will thus instruct my students to work less and leave spare time for arranging publication drafts. As a sign of my good faith, I will promise them that I will never check their data. So two new formal press releases about the scientific activities of Olivier Voinnet, and once again both formal press releases contain unfavorable quotes about the scientific activities of OV. So who wants to collaborate with someone who got an extension of his sanctions up to 2023 and who wants to collaborate with someone who has a recent press release about his PhD thesis with such a contents? Is there anyone who has an idea how many formal press releases with unfavorable quotes about the scientific activities of OV have been released? who wants to collaborate ...? ‘Severe’ figure manipulation found in studies from leading plant lab. Let your lab team produce high impact publications by manipulations and falsifications – there will be no consequences for you! I am writing to provide a factually accurate statement concerning the actions by The Sainsbury Laboratory (TSL), following the allegations made originally on PubPeer regarding publications co-authored by Dr. Olivier Voinnet, when he was a PhD student at TSL. At that time, I was Chair of the Council of TSL and Prof. Cyril Zipfel was Head of Laboratory. At the time of the original allegations, we communicated on that site that they would be investigated. Here, I clarify the actions that were taken. The procedures of TSL required the Principal Investigator to take responsibility for answering the allegations and correcting the scientific record, where necessary. This was carried out by the authors of each of the publications and duly noted by TSL. The Council of TSL referred Dr Voinnet’s PhD thesis to the University of East Anglia (UEA), which undertook a formal investigation. The University made a public statement regarding the conclusions of the investigation, which are accepted by TSL. 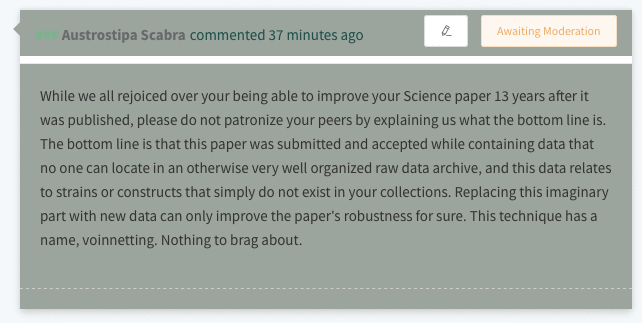 I posted a statement to that effect on PubPeer on September 12th 2018. I want to assure you that TSL took the allegations very seriously, followed its procedures precisely, and accepts the conclusions of the investigation that took place at UEA. We consider this matter now closed.